Brazil nuts are a good source of unsaturated fatty acids, vitamin E, squalene and phytosterols, which are beneficial both internally and externally. These nuts are so rich in oil that they will burn like a candle if lit. 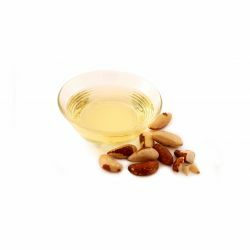 Brazil nut oil has a high affinity with the natural oils produced by our skin and scalp and it will absorb with ease. It is moisturising and conditioning for skin and hair. The oil is a popular cosmetic material and used in soaps, skincare and hair care. They are the edible seeds of a South American tree, which grows in the Amazonian rain forest. Brazil nuts are of great commercial importance to the local people there, and a vital part of the forest’s ecosystem. We’ve used Brazil nut oil in our Jasmin and Henna Fluff-Eaze hair treatment to moisturise the scalp and add weight and shine to the hair.